Donating to charity is a wonderful feeling that leaves most people feeling exceptionally fulfilled. However, keeping track of these donations for various purposes can leave people feeling exceptionally frustrated. Take the frustration out of the equation by using the charity checklist template from Microsoft. With the charity checklist template from Microsoft, you can keep track of all your charitable donations all in one place. Another benefit is there’s no charge associated with the Microsoft charity checklist template. You can download and begin using the charity checklist instantly by clicking the link located on this page! 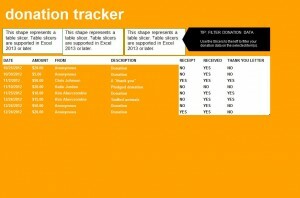 The charity checklist is a ready-to-use template designed in Microsoft Excel. All parts of the checklist are customizable, so feel free to make any alterations that are necessary in your situation. The “Date” category is reserved for noting the date the donation was made or received. Next, add the amount of the donation, followed by the name of the donator. Next, provide a brief description of the donation. For example, if cash was donated, simply mark “cash”. The next step in using the charity checklist is to note whether or not a receipt was available and if one was received. The final step is to mark if a thank you letter was either shipped out or received for the corresponding donation. Keep track of all of your charitable donations quickly and easily with the Microsoft charity checklist template. Download this incredible template for free today!